Randolph Charles Bachman, (; born September 27, 1943) is a Canadian musician best known as lead guitarist, songwriter and a founding member of the 1960s and 1970s rock bands The Guess Who and Bachman–Turner Overdrive. 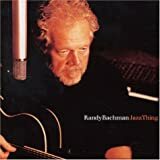 Bachman was also a member of Brave Belt, Union and Ironhorse, and has recorded numerous solo albums. He is also a national radio personality on CBC Radio, hosting the weekly music show, Vinyl Tap.